Encyclopaedia Britannica Group Launches Free Chrome Browser Extension - ExtFans - Download Chrome Extensions From Here! Britannica Insights helps searchers cut through the clutter, save time, learn more, be sure about their results. 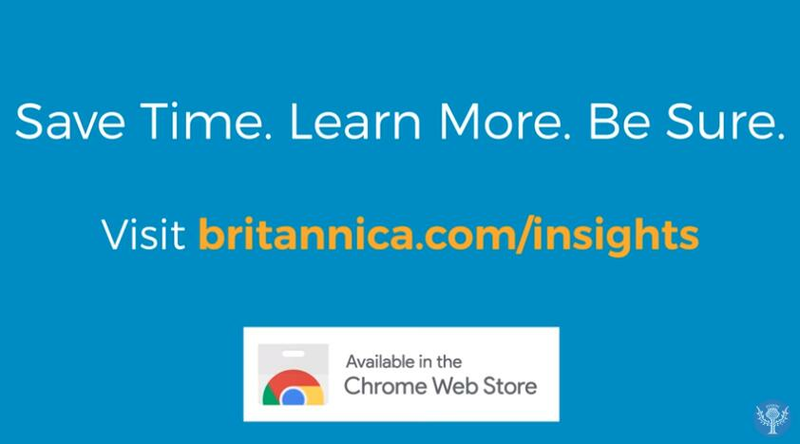 The Encyclopaedia Britannica Group today announced Britannica Insights, a free Chrome browser extension that enables searchers to cut through the noise on the internet and provide trusted and verified information at the top-right corner of their search results page. "For 250 years, Britannica has defined what it means to provide trusted and verified information," said Karthik Krishnan, global chief executive officer of the Britannica Group. "With the addition of this latest extension, Britannica Insights will make it easier for everyone from kids to curious adults to professional researchers to find trustworthy results faster. Now more than ever, how we discover information matters." "Save time. Learn more. Be sure." Watch the video here. Britannica Insights works with major search engines – Google, Bing, Yahoo, and others – on the Chrome browser. Current search engine algorithms are not yet advanced enough to differentiate between credible and plausible information. Searchers click beyond the first page less than five percent of the time to look for more credible information that may be buried in back pages. On user-generated content sites an answer could be right today and wrong tomorrow because of warring factions trying to slant information to benefit their own agendas. On social media it is hard to discern whether the information is coming from verified sources. A search on "climate change" presents both quick facts as well as a "deep dive" into coverage of climate change through geologic time and the impact of climate change on rivers, glaciers and icebergs. A search on Barack Obama brings up not only a basic overview of his life and presidency but also deeper coverage of his role in historical events such as the Syrian Civil War. Britannica Insights is the latest resource in the toolbox. Another recently launched initiative, Demystified, provides engaging and revealing answers to commonly asked questions such as: What's the difference between veins and arteries? How does the U.S. Electoral College work? Does listening to Mozart in the womb really make babies smarter? Britannica also makes it easier for young learners and non-native English speakers to look up word definitions without leaving the page by linking hard words to definitions from Merriam-Webster, a sister company. "The first sentence on the first page that Britannica published in 1768 says. Utility ought to be the principal intention of every publication,' and this imperative to meet the user's needs is more important today, in the digital world, than ever before. The media we work in may have changed, but our mission has not." said Krishnan. The Encyclopaedia Britannica Group is a global leader in education whose flagship products, from Encyclopaedia Britannica, Britannica Digital Learning, Britannica Knowledge Systems, Merriam-Webster®, and Melingo®, serve the needs of students and consumers on multiple platforms and devices. Encyclopaedia Britannica, founded in Edinburgh, Scotland, in 1768, marks its 250th anniversary this year. A pioneer in digital learning since the 1980s, the company today serves the needs of students, lifelong learners, and professionals by providing curriculum products, language-study courses, digital encyclopedias, and professional readiness training through its extensive products.